Adi Dassler, together with his brother Rudolf Dassler, created the Adidas logo, aiming to provide the athletes with the finest possible gear. For years the only symbol associated with Adidas was the trefoil (flower) logo design. The 3 leaves symbolize the Olympic spirit, linked to the three continental plates as well as the heritage and history of the brand. The “Trefoil” was adopted as the corporate logo design in 1972. I think the logo of Adidas uses positive and negative space very well. The three parallel strips are typically featured on the company’s clothing and shoe logo designs, so people easily recognize their products based on this really famous logo. 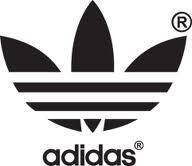 In January 1996, the Three-Stripe brand mark became the worldwide Adidas corporate logo. This logo represents performance and the future of the Adidas branding identity.